Do you want the hair, that every women gets dreaming about ? Ever since college , I have been using the phrase, "Let me show you how to dance with your hair ". Come 2015, I feel like re-phrasing it all again, and say " Lets turn head with Show-Stopper hair. Believe you me,I like when hair color does the talking. Its like people say- You light up the room,every time you walk in #justsaying. So for all those of you, who feel that your hair should be a true bombshell, and let your inner beauty shine through strongly on the outside too, wait till I tell you about the Lakme Showstopper collection !! Lakme Showstopper collection is all about a blend of classic and modern styles and skillful versatility of technique in cuts and colors. 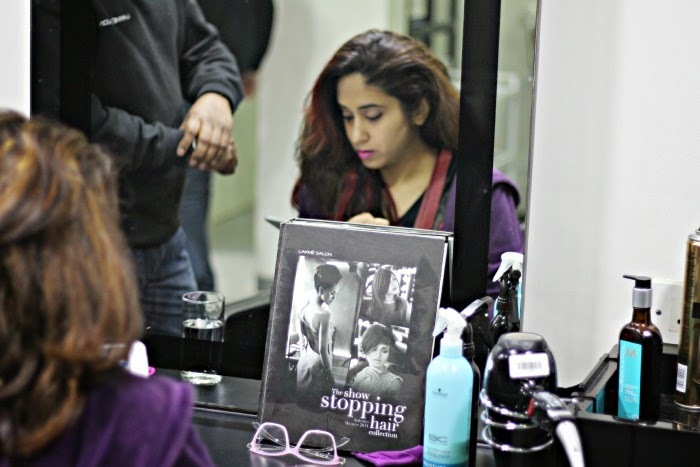 I walked in at Lakme Salon, Naraina, to check out what would my show-stopping hair be like . To begin with I was a bit skeptical as I was totally confused into exactly what look I wanted. Thanks to such a great teaser via the media look book sent in by team Lakme, and brilliant looks that could just be a brush away !! Being notorious by now for hair experiments, I just didn't want it to turn out something drastic, which I could take time to relate, more than that, you all could not accept me for ! So we decided to try the Helix Flair, from The lookbook, since I already had color in my hair, and re-coloring was not a great thing,except the minor-touch ups which were needed of-course. This way could experience and walk off from the salon ,with a tasteful Auburn Blend (which is a hue of red streaks and hot fringe cut ) and a Helix Flair- which involved a fusion of asymmetric cut with blond and Purple streaks . 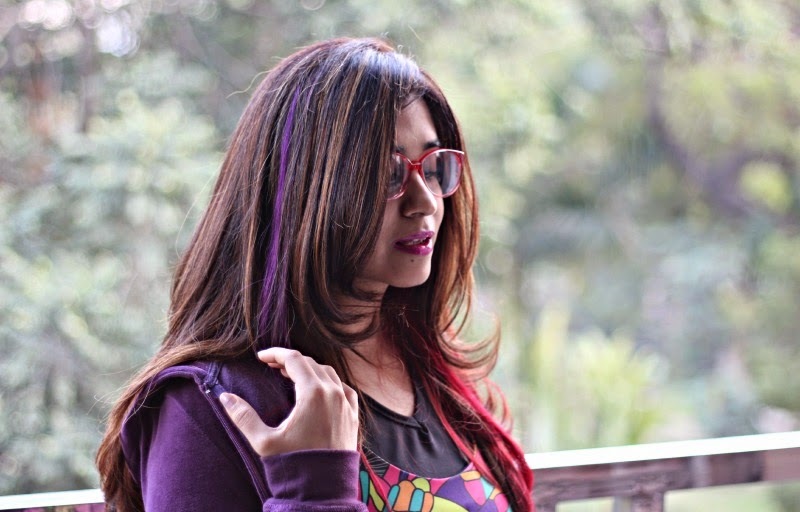 For all those who have seen my before look- I already have Fuchsia colored streaks, but now with the Lakme Showstopper collection, I was able to get a nice , bright, Purple hair extension, which just complements my hair so well that I have a feeling that I could now take on the world with my hair !! lol #justsayingagain. A good hair color boosts confidence, and for me its mental therapy. I always come out felling good. Even if it means bugging the stylist, and re-checking with him on exactly what is the final outcome ?The Lakme guy, Satish just magically went, and mixed some color ,like a Pro, and showed me several pics, on the final outcome and promised that exact would be delivered, so that I could just sit back and get my caffeine high, and rely on his expertise. We decided to get rid of a few streaks of fuchsia color, since I was already getting extensions in a Purple. Too much color here and there would have not been a good idea. This is the final look,post the application. The color looked so fresh and I was happy with my high n low lights and of course the purple extension(made of real human hair) which he strategically placed. The extension grows out with the hair, and lasts for up-to two months. The only maintenance they need is the gentle stroke of brushing and no pressure on the area. 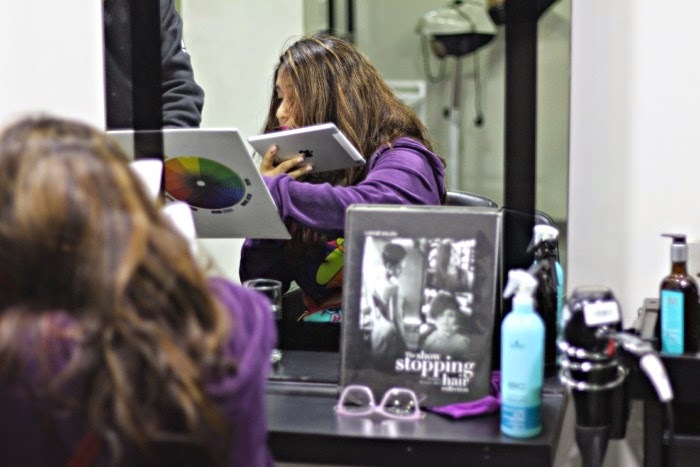 The color would never bleed, and it is fully heat resistant and can be styled in any way we like. My blonde streaks just kept the style right for me, and as close to what I had expected. Its been three days, the color rocks , and I have been getting compliments all the time. Hope you like my look ? Now you can get yourself a hair fix too like this at any Lakme Salon, coz they have not only revealed some trends which are sparkly and new, but are showstopper and runway inspired that suits one's face, and hair texture. i actually think it looks amazing! I would never be able to pull it off!